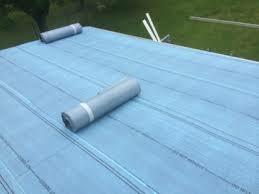 Austin Roofing Company That Installs And Repairs Flat TPO Roof And Asphalt Roof. There are two main types of flat roofs but not limited to: (1) Thermal Plastic Olefin (TPO) and (2) SBS modified asphalt. 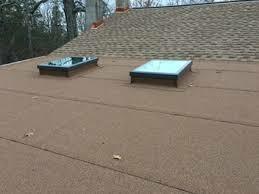 There are a number of applications for these type roofs but a good rule of thumb is to use this material when the pitch of the roof is less than 2 ½” drop per 12 lineal inches. Any pitch less than this will void [shingle] roof material manufacturer’s warranty and possibly your metal roof warranty. Today there are many options, grades/quality or materials, and benefits associated the different materials. 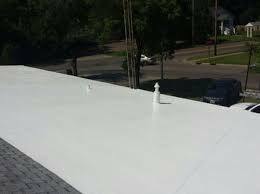 Call us to discuss your flat roof needs and how best to fulfill them. Thermal Plastic Olefin material is a hot air weld, single ply polyester reinforced membrane that is highly flexible and does not degrade with ponding water. Typical residential and commercial applications are 45 and 60 mil thick membranes with a white color to give the membrane an energy star rating. Energy star rated tan color and gray are widely available also. Custom colors for the membrane are available but with a significant upcharge. Commercial applications can call for thicker membranes if the specifications require puncture resistance or special application. TPO flat roofing is the best “bang for your buck” flat roof. 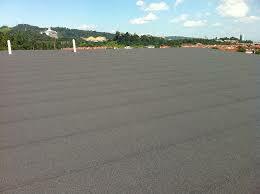 Modified asphalt material is good for evenly pitched flat roofs with no ponding water. 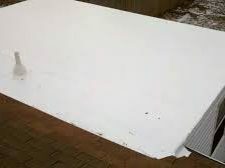 If the roof has a history of ponding water, do not use this choice because this material tends to break down over time and decrease the life of the roof from ponding water. Yes, the roof can be prepped on tear-off and leveled to some extent with various types of board, but any imperfections in the roof can and will show up over time. Safe applications for this roof material are porches interfacing with pitched shingle roofs that have a continuous slope. The majority of these roof systems are not energy efficient either. 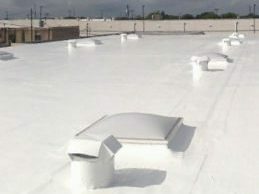 Combining an energy efficient roof coating with this system will give you the highest energy efficiency.